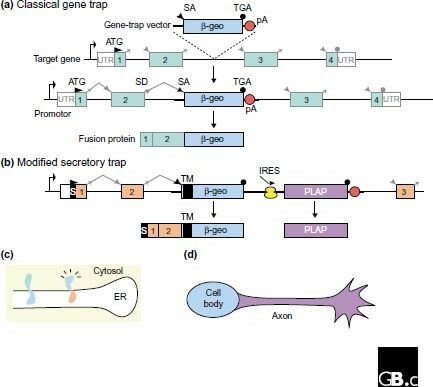 Mechanisms of classical and secretory gene traps. (a) In this example, the classical gene-trap vector inserts into a gene (in this case encoding a protein without a leader sequence) between exons 2 and 3. During transcription from the target-gene promoter, the splice-acceptor site (SA) at the 5' end of β-geo is spliced to the next upstream splice-donor site (SD). The vector polyadenylation signal (pA) stops transcription; a truncated transcript is thus produced that encodes a fusion protein between sequences encoded by exons 1 and 2 of the target gene and β-geo. UTR, untranslated region. (b) The modified secretory-trap vector incorporates a transmembrane (TM) domain, an internal ribosome entry site (IRES) and an alkaline phosphatase (PLAP) gene. Only the situation after insertion of this vector into a gene encoding a protein with a hydrophobic leader sequence (S) is shown. A bicistronic transcript is produced, encoding first a fusion between the endogenous protein and β-geo that localizes to the neuronal cell body and second the PLAP protein, which localizes to the entire cell surface, including the axon. (c) Modified secretory trap insertions into genes encoding proteins with hydrophobic leaders apparently result in fusion proteins that are inserted into membranes in a type I orientation (right) . This places the β-galactosidase domain of β-geo (blue) in the cytosol, where it is more active than in fusions with leaderless proteins; the latter result in a type II orientation (left) with β-galactosidase in the lumen of the endoplasmic reticulum (ER). (d) Expression of β-geo (blue) and PLAP (purple) in a neuron.